Diamond happens to be one of the highest priced precious stone used in jewelry. Designing a men's diamond ring can pose a few challenges. 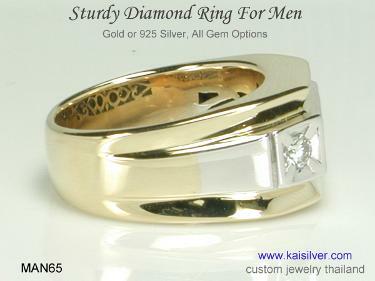 Men love to wear heavy rings with large stones, diamonds show a steep price rise as the stone size increases. The MAN65 is a custom made ring which means that, every single feature in the ring can be modified to suit your preference. One look at the ring and you will be impressed with the sturdy construction and broad dimensions, the unmistakable fire and glitter from the diamonds define their own luxury statement. The ring is shown here as a two tone gold men's ring, you can request for a single gold color or even order the same men's diamond ring in sterling silver. Most jewelers give secondary importance to silver jewelry. 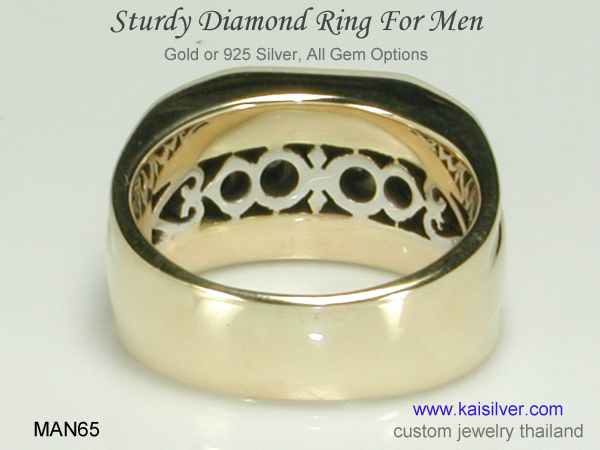 At Kaisilver the same team of expert artisans and diamond setters work on the silver and gold ring. Fine jewelry is generally crafted in 14k gold, this gold alloy shows good durability and has sufficient hardness. The MAN65 men's diamond ring is available in 14k or 18k gold and you can choose from, white, yellow or pink gold. If you wish to buy a 10k diamond ring for men, email our support team and request for a price quote. The ring is available in all sizes and is crafted in gold and 925 silver. 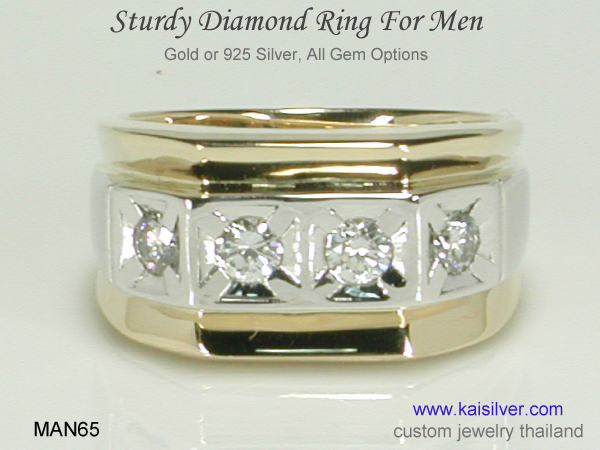 The men's diamond gold ring can have a single or dual color tone. The same superior quality standards are maintained for the gold and silver ring. 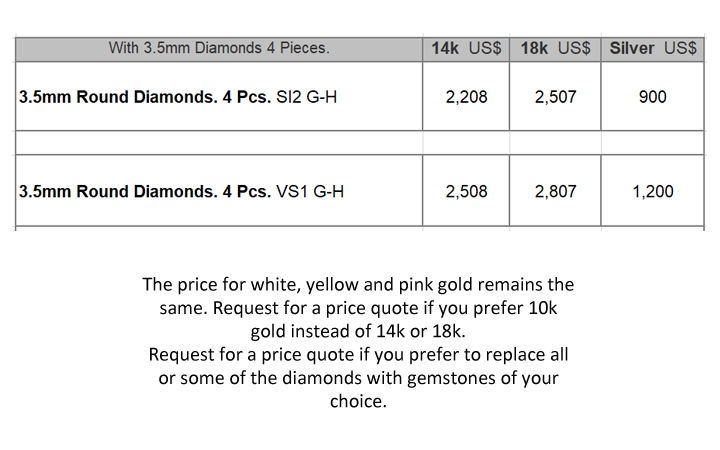 You have options for 14k and 18k gold and 10k gold prices are available on request. We allow you to select white, yellow or pink gold in 14k and 18k. There are 4 diamonds in the ring, you can select 3.5mm or 4mm round diamonds. You can request for some or all of the diamonds to be replaced with gems of your choice. 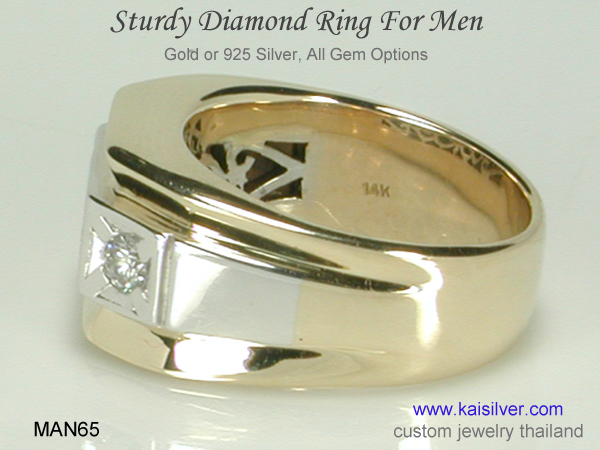 The diamond ring for men has a head height of around 12mm to 14mm. The portion behind the finger, has a band with of around 5mm to 6mm. A hefty metal weight of 25 grams is provided to support the large ring dimensions. Diamond rings with significantly large sizes, might require additional metal weight. Since the MAN65 diamond ring is made to order, all ring size requests can be accommodated. Diamond rings have always enjoyed a special status and are an excellent display of wealth and sophisticated style. Science has confirmed the existence of diamonds in a range of colors but, white remains the favorite. This the color that symbolizes purity and sincerity. The expensive nature of diamonds combined with its stylish look, make the stone perfect for formal occasions. There was a time when men were not prepared to wear a wedding ring, big changes have now been established. Men's diamond wedding rings have always enjoyed a consistent demand, this ring incorporates all features that you would expect to find in a high end jewel. The design concept of the ring, focuses all the diamond glitter in the center of the band. 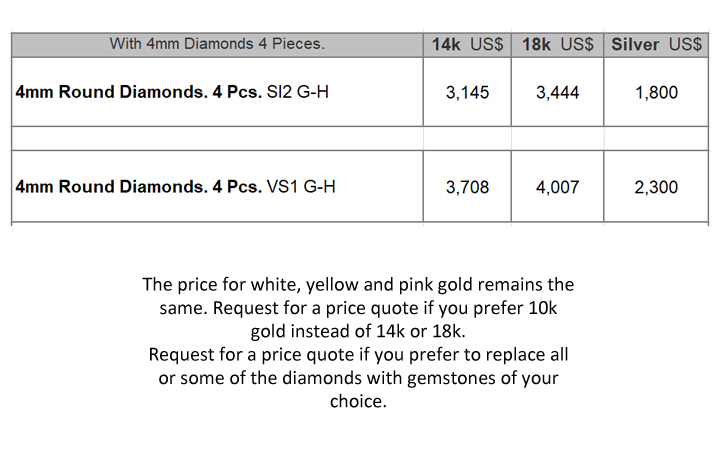 This gives the diamond a special look, you get that at a very reasonable price. Customization: We have mentioned more than once in this report that, this diamond ring is custom made. There are some major advantages of choosing a custom ring, here are some ideas to inspire your imagination. All design elements in the MAN65 men's ring can be modified to suit your liking. 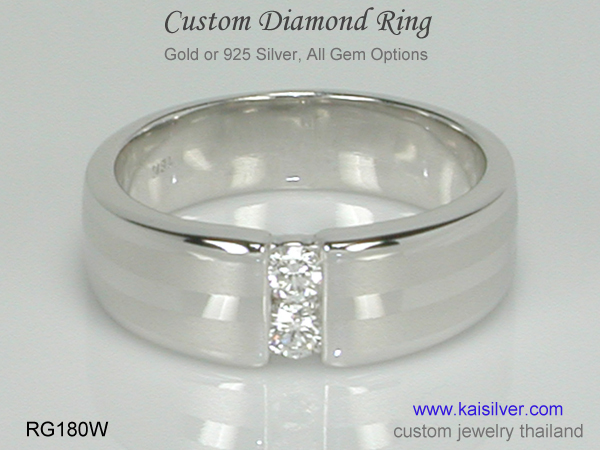 We can even make a completely different ring for you based on your own design concept. We did mention above that, it is possible to replace all or some of the diamonds with gems of your choice. There is no limit on gemstone selection, you don't need to restrict yourself to what you see on our website. You have an option of gold and silver and the diamond gold ring is available in 14k or 18k gold, yellow, white and pink gold can be selected for both gold choices. Men seem to have a liking for sterling silver, besides a very economical price point, silver also exudes a confident and reliable appeal. We can accommodate requests for larger diamond sizes, price quotes will be provided once we know your requirements. How To Buy: Despite the rapid movement of the online jewelry market towards 'instant buys' and 'express checkouts', we strongly feel that fine custom jewelry needs a more human based approach. Discuss your requirements with our experts at sales@kaisilver.com Once you have the basic information, let us know if you wish to have our team talk to you on the phone. Our expert staff will learn about your requirements and prepare for the call. You can email us with your phone number, location and preferred time (your local time) to receive the call. We will bear the cost of the call and you will be under no obligation to make any purchase from us. You can also email us designs and sketches of jewelry that you would like us to make. Once you have complete information about the product that interests you, move to the payment process. We have a 4 to 6 week, production period after the payment is confirmed. We prefer Paypal as the mode of payment but, can also accept Western Union. Let us know the payment mode that you prefer and we will provide details for the same. Kaisilver: We are one of the pioneers in the online jewelry sector. More than 7,000 quality conscious buyers rely on us for all their gem and jewelry requirements. Equal quality standards are maintained for silver and gold custom jewelry. You can pick a design from our website or send us your design concepts. We have a strong presence in the gemstone markets and source most gems directly from the miners. The cutting process is controlled by us and this eliminates the middlemen commissions that most jewelers are forced to pay.